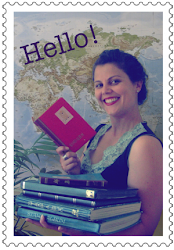 This week on Sunday Stamps, the theme is 'poetry'. In order to play along, I have chosen a series of stamps inspired by a film inspired by a poem. I love this film, and revisiting the trailer makes me very nostalgic! It is so cheesy! So 80s! 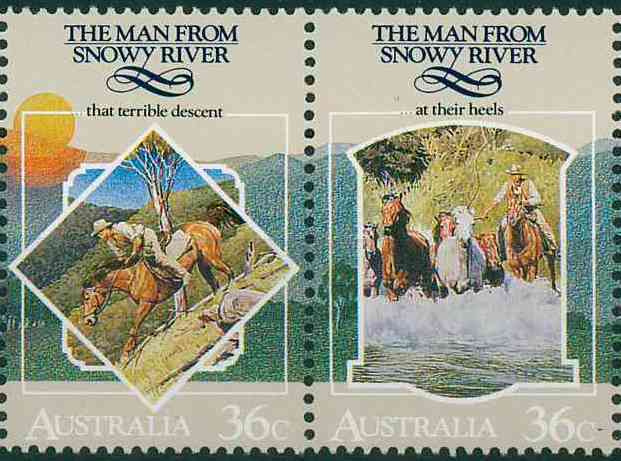 The stamps were not in fact released until 1987, right before the Man from Snowy River II was released. So the stamps may not really be officially linked to the film, and that is just my own connection upon seeing the stamps and thinking "film" not "poem"; but to me the images on the stamps look like painted stills from the first movie. The middle stamp of the strip of five, labelled "that terrible descent" represents the film's most famous and breath-taking scene, taken straight from the poem itself. 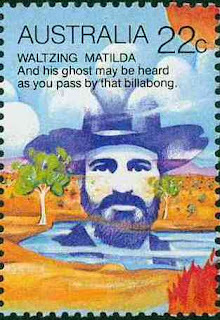 I was watching a doco on tv the other night, and learned that from a billabong in outback Queensland, near where Banjo supposedly wrote his famous poem 'Waltzing Matilda', there is a big paleontological site. And Banjo Paterson now has his own dinosaur: the Australovenator wintonensis is lovingly nicknamed 'Banjo' by paleontologists. Although featuring on a stamp (or stamps, in Banjo's case) would be pretty amazing, I have to say having a dinosaur named after you totally takes the cake. Lovely stamps and thanks for the movie trailer. I really like the Waltzing Matilda set, lovely designs and colours. It's good to know about this poet. I was unaware of the Man from Snowy River - both poem and cheesy 80's film. ;-) Thanks for participating. I knew Waltzing Matilda, who wouldn't? :) But that's as far as I got. It's so interesting to find out more. I love the stamps, the Snowy river ones as well as the Waltzing Matilda series, both sets new to me. 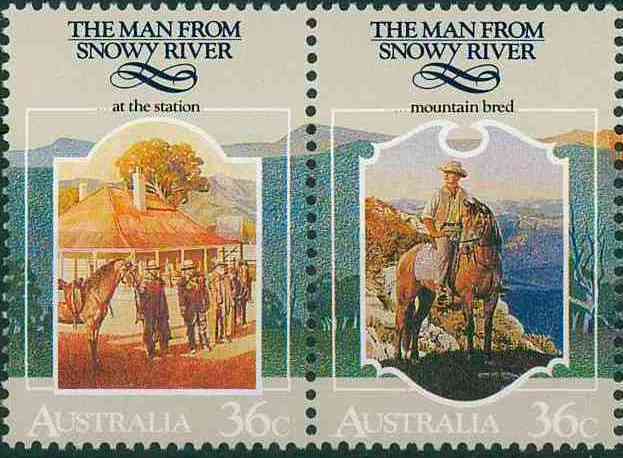 Thank you for posting this; I too know 'Waltzing Matilda' but why have I never heard of 'The Man from Snowy River'? i'll be looking out for it - cheesy or not! Lovely stamps too. It's an interesting range of poets we are all coming up with! I have seen the movie and was thrilled to actually see the Snowy Mtns when I was in Australia. I'd not read the book (though have now read through parts of it - thanks for that link to the story.